First off, you’re probably wondering what in the world portable soup is. It’s essentially a broth that has been dried and solidified for easier storage, preservation and portability. It has a ton of flavor packed into a very small package. It has been called by many names, including pocket soup or veal glue. It’s kind of like a homemade, old-fashioned version of the bouillon cubes you can buy in the supermarket today. What Is Portable Soup Used For? Portable soup has a long history, with the first recipes for it being found in the 17th century. It was quite popular in the 18th century due to the fact that it didn’t require any preservation and it was light and easy to pack. It was used as a portable food source for traveling, even on large and famous expeditions. Lewis and Clark packed portable soup in their food stores on their famous expedition to chart the U.S. It was also used as a food for invalids or others who had to be on a liquid diet, since at that time there were a lot less options for keeping those people nourished. Because it had to be cooked over an open fire, a much less precise application of heat than we have available to us today, portable soup was not simple to make before the advent of electricity. This meant that it had to be constantly watched, to keep the heat steady and prevent burning or scorching. Today, a slow cooker means that the temperature of the broth can be easily controlled. If you’d like to make some portable soup of your own, here’s how you can do it with a more modern twist. Note that you could replace the beef shank roast with another high-collagen cut of meat like the neck, or you could even opt to make chicken portable soup by using a whole chicken. Here’s what you’ll need to cook this recipe up in your kitchen. 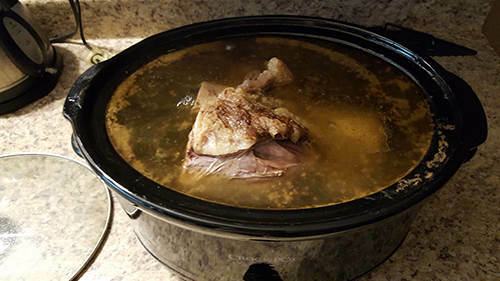 Make a bone broth – Place the roast in slow cooker and fill the slow cooker with water. Turn it on low and cook for eight to ten hours with the lid on. Mostly, you’ll want to leave it alone to cook, but make sure that the meat stays covered with water. Add more if the water level starts to get low. Remove the solids – Pull the meat and bone out of the slow cooker and set aside. The bone should probably be trashed, but the meat can be used in another dish. Let the cooker cool – Let the slow cooker cool completely. This will allow the fat to set on top of the top of the broth for easy removal. Strain the broth – Pour the cooled broth from the slow cooker through a piece of fine grade cheesecloth into another container. A large bowl will do nicely. 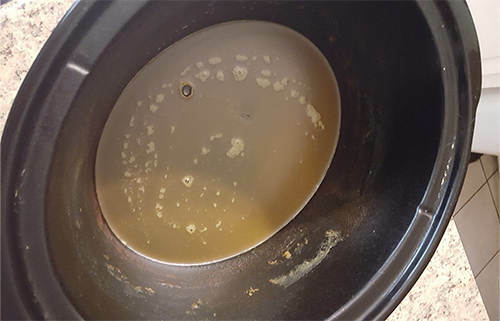 Clean the slow cooker – Give the slow cooker a good wash to make sure none of the fat and solids you’ve, up until now, worked so hard to get rid of, don’t make it into the final broth. Those things could make the portable soup susceptible to going bad. 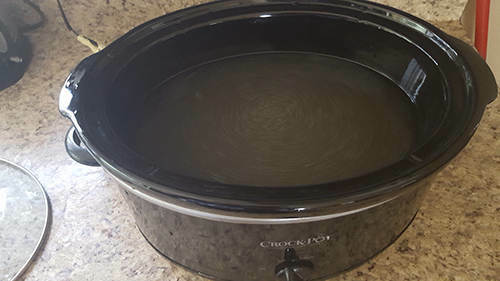 Reduce broth – Pour the broth back into the slow cooker and turn it on low for 24-72 hours with the broth uncovered. 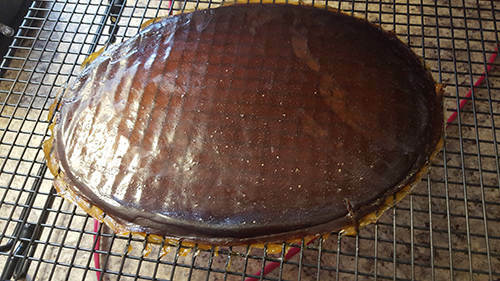 This will reduce the liquid from the broth, until there’s about ½ inch left in the bottom of the slow cooker.When it’s finished, it should look like a lot like prepared gelatin. Towards the end of this time period, be sure you keep a close eye on your portable soup to prevent burning. Burnt portable soup is disgusting enough to not be edible, apparently. Let cooker cool again – Once again, let the cooker cool completely. Dry gelatinous soup – Peel the gelatinous reduced broth out of the bottom of the cooled slow cooker. Place it on an ordinary kitchen cooling rack and place an electric fan in front of the jellied broth on high. Leave it until it’s completely dried out. This should take a few days, but could take up to a week depending on the moisture level in your home. You’ll want to carry out the drying in a place that will be relatively undisturbed where dust and debris are unlikely to land on the broth. 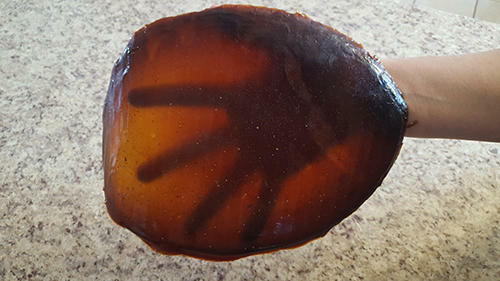 It would be tempting to toss this gelatin-like blob into the oven to dry it out, but that will absolutely burn it. Many dehydrators are even out of the question since they utilize low heat to remove the moisture from food. If you don’t desire to use a fan, you can place the reduced broth on a clean, tightly woven cloth and turn it several times a day for a week or so until it’s completely dry. Break into pieces – You’ll want to cut the portable soup into chunks that measure about one square inch. Regular (clean) scissors work great for this. Store it by wrapping it in parchment paper or cheesecloth, placing it an airtight container, or keeping it in the fridge in a plastic bag. It can keep for up six months under favorable conditions. What Do You Do with Portable Soup? It’s important to note that this is a very basic portable soup recipe and it will act more like a soup base than a meal in and of itself. You’ll likely want to add herbs, spices, greens, vegetables, or at the absolute very least, a little salt to make it palatable. In an emergency where you needed an energy boost post haste, you could just place a small piece of portable soup in your mouth and allow it to melt, but that would be pretty gross. 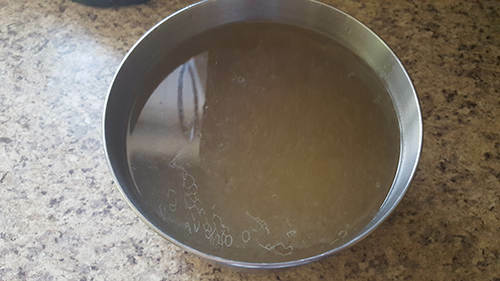 Instead, boil a piece of the soup in water with whatever other soup ingredients are handy until it’s fully dissolved. You might consider whipping up a couple batches of portable soup to add to your survival stores. In a SHTF situation, this could provide you with nourishment that is compact and lightweight, which would make it perfect for bolstering your stores without taking up much room or for adding to your bug out bag. I’m with you, Wannabe. Perhaps after all the bouillon cubes are used up, this would be useful but in the meantime I have other more pressing things to address than making bouillon. Excellent information. 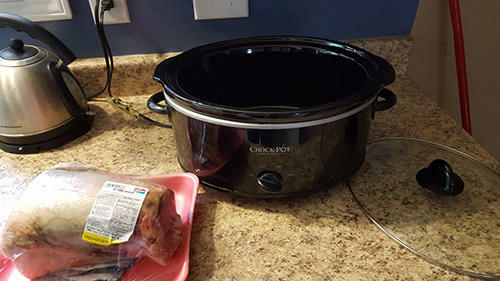 Thanks for the post, I don’t usually read through slow cooker recipes and as with this one, I would skip much of the first step and cook it in my stainless steel pressure cooker with the lid on and do the reducing on the back of our pellet stove, maybe set up on a brick or terracotta tile to minimize burning. It may take some experimenting to adapt to the conditions with which I work, but this is such a great idea, I would see the need to try. I grew up with home dried fruits, vegetables, and bullion powder or cubes. I can see doing this with bone broth and saving the many jars for other things than broth. I cook a lot on my rocket stove with its optioal gravity fed pellet hopper. Soups and broth are often happily bubbing there. This sounds like a great way to preserve broth for future use. My first notice of this was from the novel ‘The Swiss Family Robinson’ where it was called ‘soup cake’. You mention the Lewis and Clarke party, but when some was issued, the men preferred to slaughter one of their own horses. Perhaps the commercial version was worse. 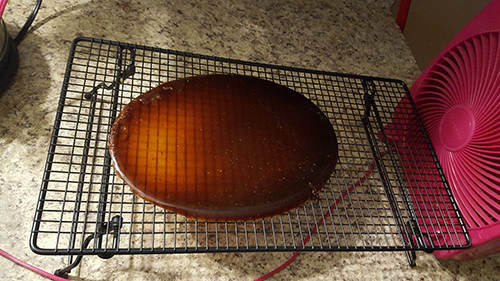 I havent tried to make it yet, but I will also try using my dehydrator on it. Seems labor intensive for very little return. However, if scavengers think that’s all you have they might give you food! 😜 Kidding aside, can’t you use pemmican to make soup? It wouldn’t have the same body, but it seems easier and has longer shelf life. pemmican contains a lot of grease. This recipe calls for eliminating the fat from the broth because that will hasten spoilage. I don’t know about pemmican, but jerky seems like it would work. It does seem pretty work intensive for a small return. It’s not all that labor intensive; it just takes a lot of time. In a long-term crisis scenario it does give you a good way to process meat into a lightweight and concentrated food ingredient. Personally I agree with Wannabe and Left Coast Chuck that bouillon cubes are an easier alternative *in normal circumstances*, but if the circumstances aren’t normal anymore this is a good piece of knowledge to have. At first, I thought this was just dehydrated soup or bullion, but I understand this requires careful drying. In addition to making this dried broth, I would also dehydrate some onions, celery and herbs. They can be made into powder if one desires. I think that dehydrated food is very practical, weights little, takes little space, is easy to store and perfect for travelling. Despite comments about time and such, this is an easy way to make something with little gear and minimal practice. If there is a real crisis or apocalypse with major if not total loss of utilities and disruption of resupply efforts meaning no trucker or trains bringing in goods, there will be plenty of time to work on fulfilling basic needs. That will be the priority. As with ALL things related to survival, at least learn about it, and be prepared to use it. 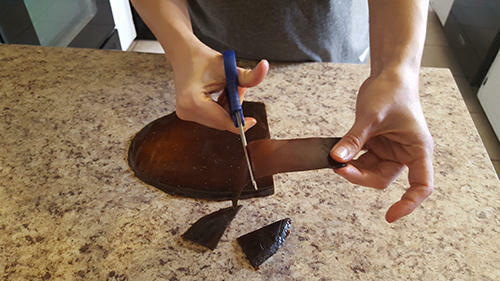 If you have a need for an item or technique, the possession of a tool or gear or the awareness of a method will always be a tool in your mental survival kit. Does anyone know how long pemmican lasts? Porto soup is 6mos according to article, so if it’s an equal length of time it could be a viable adjunct. 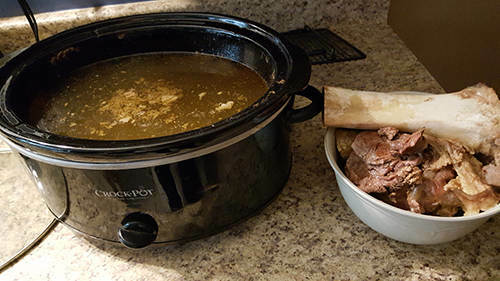 Using your bones to make Porto soup is a good way to extract every bit of nutrition from your meats, and could be handy but it just seems labor intensive. Thoughts? This dehydrated soup stock is high in protein but by its preparation is low in fat. It is okay for a supplement if you diet is lacking in protein but you do need fat. The book about life on the plains in the early 19th century describes one particular trip across the Rockies where game and grass were quite scarce. The men on the expedition were eating their horses. Despite the fact that they had sufficient food, the horses were so lean that they contained so little fat that the men, even though they were eating every day were losing weight and strength. This dried soup is only something that’ll assuage your hunger but it won’t sustain you over a period of time. That’s why pemmican was so useful on high energy tasks such as a hunting party, war party or trading trek. 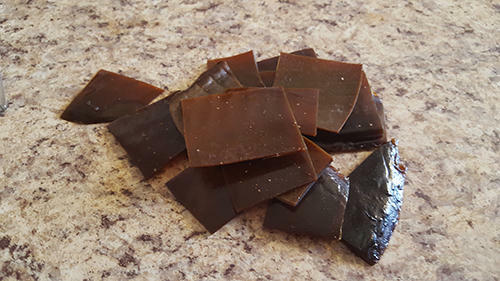 It contained protein, fat and vitamins from the corn or other vegetables in the pemmican. How long pemmican will last depends on the weather conditions. In the summer in Tucson AZ or Tupelo, MS, not so long. In the winter in northern Minnesota, probably six months or longer during the colder months. That calls to mind a saying I heard once “starving to death whilst feasting on rabbit”, but I can see where it might have its uses. Thanks, Chuck. Rabbit and trout. I have read that early mountain men actually starved to death in the winter time because a significant portion of their diet consisted of rabbit. Also trout is very low in nutrition and you will suffer from low calories and vitamin deficiency on a diet largely consisting of trout. Good weight loss item but in a survival situation calories count. While not containing as much meat, I think squirrel might be a better choice in a survival situation. However, I have not done any reading on the comparison of squirrel meat vs. rabbit meat for caloric and nutrient values. Seems to me that all the ‘careful watching’ and stirring to prevent sticking/burning could be eliminated by using a double-boiler set-up for the final ‘drying’ step? It would still be necessary to make sure the was always plenty of water, but checking that would be a lot easier and eliminate a lot of stirring and concern for temperature control! AND, the drying process could be maintained until the product was FULLY dry. Crossing the Bitterroot Mts in the fall of 1805 the L&C expedition, despite having good hunters and good weapons, could not bring down any game fit to eat. What they did shoot was under severe environmental stress, probably drought, even if you eat a starving animal their bodies are so depleted of nutrients it’s just a waste of your labor. Tribal Peoples (not portable soup) saved their asses by sharing what they had stored for the winter. The journal of that expedition is a must read. I predict that after TEOTWAWKI I will not eat even one bite of portable soup or canned cheese. Looking forward to new articles each week. I have the book LOST WAYS and have enjoyed reading. I have learned a lot. 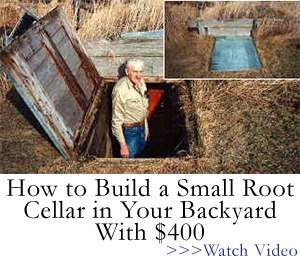 I used to be suggested this website by way of my cousin. I’m now not certain whether this publish is written through him as nobody else recognise such certain about my trouble. THANKS FOR THE SHARING THE INFO. ! !